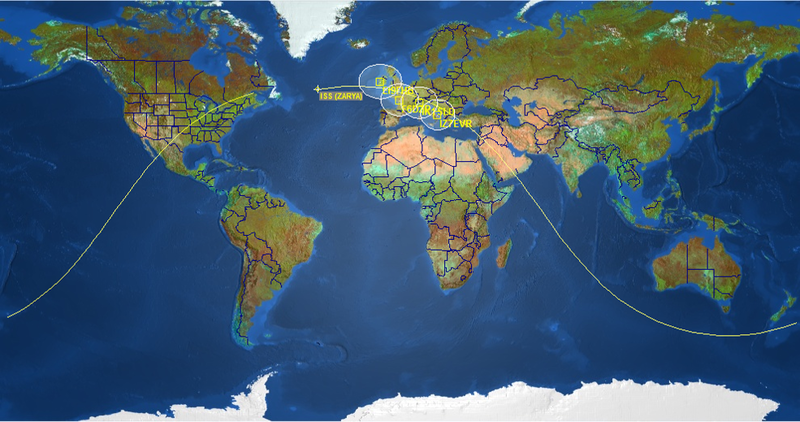 To provide 10 minutes of HamVideo reception, a chain of ground stations located along the pass of the ISS footprint, is needed. On the world map, one can see how the ISS is successively in reach of the ground stations during a descending pass. The decoded video and audio are webstreamed by the ground stations to a dedicated multi viewer, courtesy of the British Amateur Television Club (BATC). For HamTV enhanced school contacts, the audio exchange between the school and the astronaut on board the ISS is done on VHF or on UHF. There is no synchronization between the VHF or UHF audio and the webstreamed video. The video is delayed a few seconds versus the audio. This is due to the digital processing and the webstreaming of the video.